Powers/Abilities: Anansi possesses the conventional attributes of the African Gods including superhuman strength (Class 25, allowing him to lift/press at least 25 tons), stamina, and resistance to injury. He can also tap into and manipulate ambient magical energies for a variety of effects, including shapeshifting. History: (African Myth) - Kwaku Anansi is the son of Nyambe (Nyame), the sky-god and ruler of the African Gods, and Asase-Ya, goddess of Earth. (African Myth/Amazing Spider-Man II#48) - In ancient times, Anansi lived as a mortal chieftain in the region that would become modern-day Ghana. He had powers above normal mortals such as the ability to swing through the trees as a human spider. One day, he decided to climb higher than any one else had ever climbed until he reached the sky and found he could climb the sky on a celestial web into heaven where he met Nyambe, Ruler of the African God. Anansi wished to take back something from heaven to prove he had climbed so far and asked to take back the stories and wisdom of heaven, but Nyambe asked for something in return for such a gift. Anansi pledged to serve the god for all of his life as Nyambe allowed him to take the secrets to Earth. (African Myth) - Anansi used the secrets to teach his people to be civilized and to farm the earth. He introduced day and night. On one of his adventures, a great serpent soon swallowed him and all his sons rushed to save him, but as soon as he was released, he was carried off by a great bird. His six sons again rescued him. Grateful, Anansi wished to reward his sons with a great gift, but he could not decide among whom showed the most courage. Unable to decide, he returned to Nyambe to help him decide. Nyambe instead took the gift himself, which was the sun, and hung it high in the sky for all to see and share. After accomplishing everything he could do on earth, Anansi eventually ascended to heaven for one last time. Before he left, he instructed his sons and his children to spread stories of his achievements across the land so that all would know he once existed. (Thor I#398) - Still in service to his father, Anansi was present with Nyambe as they both heard the primal scream of the Enchantress over the death of Heimdall. (Amazing Spider-Man II#42) - After returning several people, who had been caught by the criminal Shade (Jake Nash) on the astral plane, Spider-Man acted against Dr. Strange's warning to not leave the path he was on and flew to a gigantic spider. The spider was Anansi, who told Spider-Man that it was not his time yet. He lashed out at Spider-Man and hit him so hard Spider-Man was hurled back to Earth. (Incredible Hercules#116-117) - Kwaku Anansi attended the Council of Godheads gathered by Athena to prepare a team of godly champions to confront the Skrullian gods. However, he did not provide any champions from amongst his own ranks and openly doubted Athena's intentions, suggesting that the homeless Olympian gods might have designs upon their realms while left unprotected. (Heroic Age: Prince of Power#1) - Anansi participated in a Council of Godheads meeting to talk about Athena's mortal champion Amadeus Cho. 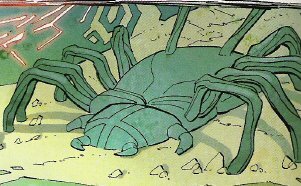 (Heroic Age: Prince of Power#2) - Anansi was present with the Council when Vali Halfling threatened them to rule over reality as soon as he had reached omniscience. Anansi asked Balder who this Asgardian upstart was and learned that Vali was one of Loki's children. (Herc#7) - Taking on the identity of pest specialist A. Nancy, Anansi went to Earth to collect stories. One day he visited the Athena Bar & Grill restaurant in Brooklyn where Hercules served him beer. They talked about Nancy's blind dog and his job as pest specialist. Without revealing his true identity Nancy even told Hercules about how Anansi once tricked Nyambe into telling Anansi all his stories. Before he got too drunk Nancy left with Coltrane. (Herc#8) - While Hercules unintentionally distracted Arachne (in a very intimidate manner) for him, A. Nancy and Coltrane wandered into Arachne's apartment and stole Arachne's Tapestry. Outside the building Nancy was nearly hit by Elektra's sai, who immediately stole the tapestry from Nancy, whose life she spared even though her orders from Baba Yaga were to kill him. Comments: Anansi was adapted by J. Michael Stracynski (writer)and John Romita Jr. (artist). The Marvel story of Anansi obviously employs the traditional story of Kwaku Anansi as a mortal who ascended to heaven. A few mythological texts, however, describe him as one of the gods themselves so presumably he started his life as a mortal as did Hercules, Asclepius, Helen of Troy, and Osiris. 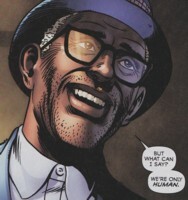 According to Spider-Mans mentor, Ezekiel, Anansi started the tradition of human totem-spirits prevalent through the African, Egyptian, and North American Pantheons. Of these, Spider-Man is just one in a long line of animal totems. Anansi stories also occur in the tales of African-American legend where they are often referred to as Aunt Nancy stories. Curiously, the wisdom-gods connection to the spider also occurs in that of Anansis Olympian Counterpart Athena in her involvement with the weaver Arachne. Anansi was impersonated by the Shadow King (actually using the spelling Ananasi) in X-Men II#77+78. Coltrane was Anansi's dog in his guise as A. Nancy. According to the god the dog was blind, but made up for it with a nose for sniffing out bugs, which aided Nancy in his job as pest specialist. It is unknown if there was any truth to what Anansi told Hercules about Coltrane. 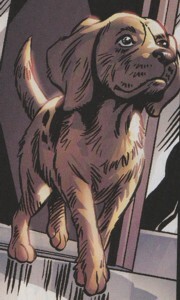 The dog was present with A. Nancy at the Athena Bar & Grill and later in Arachne's apartment.